1. Bridge Over Deckers Creek on the Green Bag Road in Sabraton near Morgantown, W. Va.
Bridge Over Deckers Creek on the Green Bag Road in Sabraton near Morgantown, W. Va.
2. Bridge Over Deckers Creek, Morgantown, W. Va.
Bridge Over Deckers Creek, Morgantown, W. Va.
3. Decker's Creek and Walnut Street Bridge, Morgantown, W. Va.
Decker's Creek and Walnut Street Bridge, Morgantown, W. Va.
View of Deckers Creek and the Walnut Street bridge on a snowy day. 4. 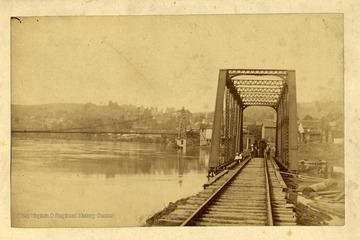 Baltimore and Ohio Railroad Bridge During the Flood of 1888, Morgantown, W. Va.
Baltimore and Ohio Railroad Bridge During the Flood of 1888, Morgantown, W. Va. 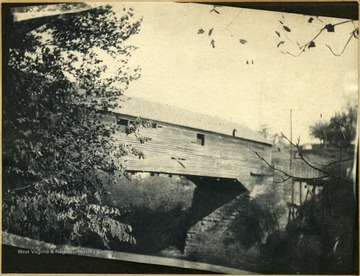 Covered bridge spanning Decker's Creek where it empties into the Monongahela River. 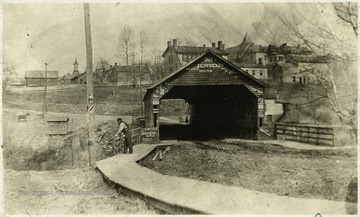 Houses and buildings visible on both sides of bridge. 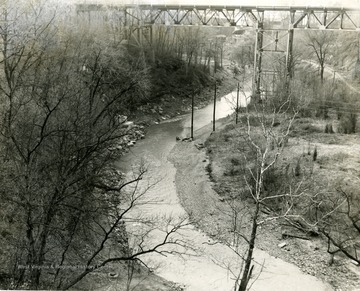 Close up view of the old 'Durbannah' Bridge spanning across Deckers Creek in Morgantown, W. Va. View of Deckers Creek running below bridge. 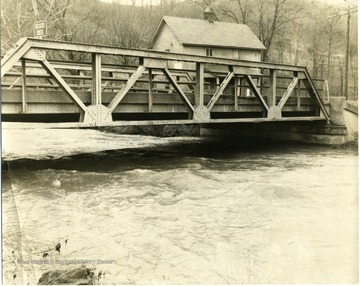 Covered bridge spanning Deckers Creek. Trees, telephone poles, and fence apparent. 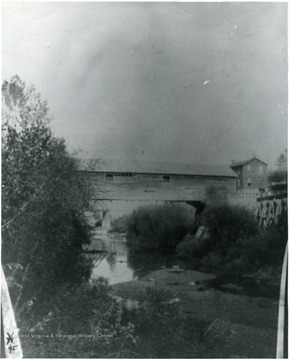 View of foundation of bridge. 8. Covered Bridge, Deckers Creek, Morgantown, W. Va. Covered Bridge, Deckers Creek, Morgantown, W. Va.
9. 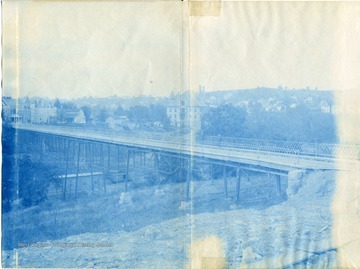 Walnut Street Bridge, Morgantown, W. Va.
Deckers Creek and Elk Street. 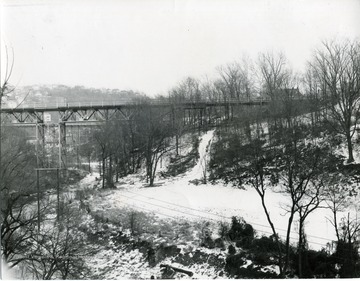 Morgantown and Kingwood railroad tracks. 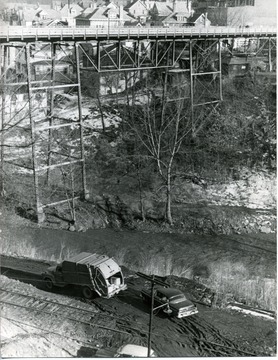 Two vehicles can be seen off of the railroad tracks. Creek at bottom near vehicles. 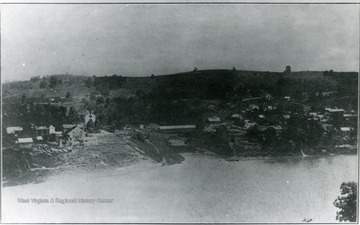 Neighborhood on far side of the bridge. 10. 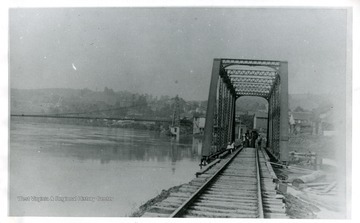 Monongahela River Flood, Morgantown, W. Va.
Monongahela River Flood, Morgantown, W. Va.
Monongahela River flood at 35 1/2 feet at Deckers Creek Railroad Bridge in Morgantown, West Virginia. 11. 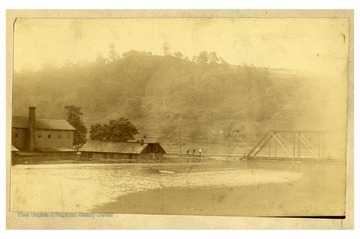 Baltimore and Ohio Railroad Bridge During the Flood of 1888, Morgantown, W. Va.
Bridge across Deckers Creek in Morgantown, West Virginia. 12. Old Pleasant Street Bridge, Morgantown, W. Va.
Old Pleasant Street Bridge, Morgantown, W. Va.
A view of the old Pleasant Street Bridge across Decker's Creek in Morgantown, West Virginia.